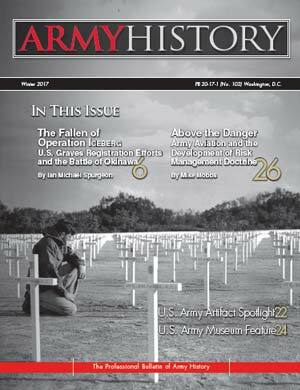 The Winter 2018 issue of Army History offers its readers something a bit different from the journal's usual content. 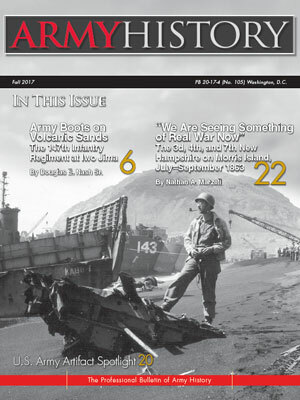 While we still present two article-length pieces, the second of these is actually a "preview chapter" from a recently released Center of Military History publication. The first article, by Dr. Thomas Boghardt, examines the little-known history of the Army Security Agency, Europe (ASAE), during the early years of the Cold War in Germany. The piece draws on numerous sources, including Army materials at the National Archives, memoirs of ASAE veterans, official histories of the U.S. Army in Europe, and some secondary sources. Most importantly, the author has mined thousands of recently declassified Army Security Agency records. 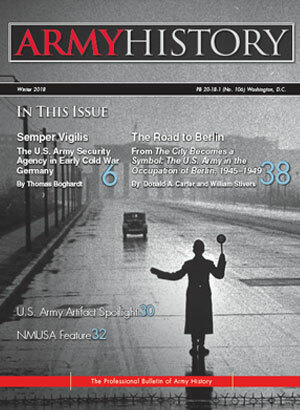 The next piece is an excerpt from CMH's recently published volume, The City Becomes a Symbol: The U.S. Army in the Occupation of Berlin, 1945–1949, by Donald A. Carter and William Stivers. Chapter 3, The Road to Berlin, chronicles the Army's movement into the city at the conclusion of World War II and the establishment of a military government. In early July 1945, two months after the German surrender in World War II, American troops entered Berlin to take over their assigned sector as part of the occupation forces of the German capital. That action concluded a long and complex negotiation among the victorious Allies and led to a series of confrontations that would turn the conquered city into a symbol of the emerging Cold War between the Soviet Union and the West. 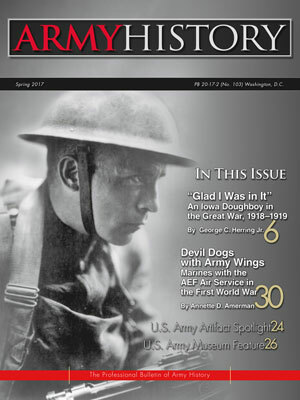 This issue also includes an Artifact Spotlight, which continues the story of Bashford Dean and the development of uniquely American helmets and armor during World War I that was featured earlier in the Summer 2017 issue. Additionally, we provide a construction update on the National Museum of the United States Army as four large, or "macro," artifacts were recently installed as the structure is built around them. In his Chief's Corner, Mr. Charles Bowery discusses the Center's education and commemoration efforts as the Vietnam War fiftieth anniversary is upon us. Mr. Jon Hoffman, in his Chief Historian's Footnote, talks about the implementation of a new process for writing and producing books at CMH. Additionally, we present an excellent crop of engaging book reviews. 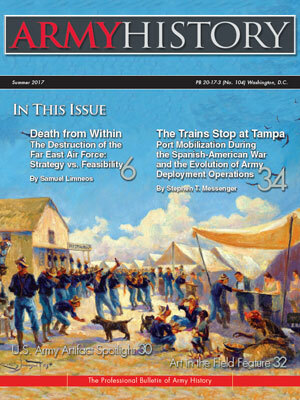 As always, readers are invited to submit articles for consideration, request books to review from our list of available titles (http://www.history.army.mil/armyhistory/books.html). I look forward to receiving your constructive comments about this issue and Army History in general.